A wicked treat without the guilt! Combine all base ingredients in Breville Kitchen Wizz Pro and blitz to combine into a crumb, or if you prefer a smoother base, until a paste is formed. If you need to loosen the ingredients to assist with processing, add a touch of water. Line a square cake tin (20cmx20cm) with baking paper, then evenly spread base into tin and place in freezer while preparing caramel and topping. Place all ingredients, except chopped almonds, in the food processor and blitz until smooth caramel is formed. Spread over the base and top with ½ the chopped almonds, then place back in the freezer once again. 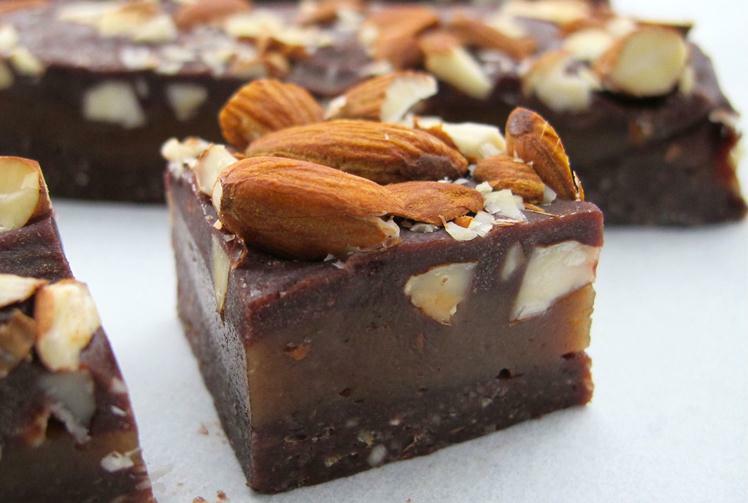 Pour molten chocolate over the slice and spread evenly then top with remaining chopped almonds. Return slice to freezer and allow to set for approximately 4-6 hours. Store in freezer and can be kept for up to 2 weeks. +Nutrition Tip: given the richness of this slice, I would suggest just eating a small portion to satisfy your sweet tooth. I have recommended 20 serves from the slice. Remember, just because they are raw treats, it doesn’t mean we need to overeat and lose the nutrition we gain from other foods in our diet to create BALANCE. How about replacing the rice malt syrup for maple syrup( genuine). Hi Daniella, Jacqeline says you can replace but it will be very sweet. So you might want to reduce the quantity a bit.